"I absolutely loved all of the classes. Especially how we get one-on-one private time with Christopher. My favorite parts though were the question and answer because Christopher helped me figure out vital information that I was completely stumped on. I learned so much from these courses and I have a much better understanding of my gifts and how to use them because of these classes. I also loved the homework assignments." THE FIRST STEP IN YOUR SPIRITUAL JOURNEY STARTS TODAY! as a gift to a loved one, or yourself, this holiday season! Email us at ThePsychicSpirit@aol.com for more details! Have additional questions? Don't hesitate! Email ThePsychicSpirit@aol.com us! 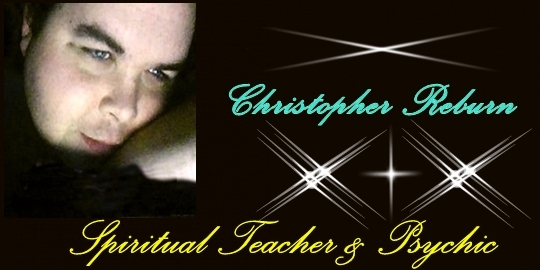 Scroll down and view all of Christopher's courses! To register for a course, please click the 'Buy Now' or 'Add To Cart' button within the course you are interested in to purchase and complete checkout! We'll contact you within 1-2 business days to confirm your course registration and schedule your classes with Christopher! All sales are final. There are no course refunds or exchanges. Space is limited! Only 10 participants for each course will be accepted. CLASSES DO FILL UP EARLY! REGISTER TODAY TO CONFIRM YOUR SPACE! Course fees are non-refundable. All sales are final. Question: Are these courses private or done with a group of people? Answer: All of Christopher’s classes and courses are private, and they are one-on-one, with just you and Christopher! Question: Are these classes done in person or over the phone? Answer: To allow more people to take advantage of his courses, Christopher does all of his courses over the phone in a private, one-on-one setting. Christopher offers a variety of times available for his courses. Once you reserve a course, we’ll be in touch with you as soon as possible to get your classes scheduled with Christopher! The time to increase your spirituality and psychic ability is now! You've heard me say numerous times on my show that we need more genuine psychic mediums, healers and spiritually gifted prophets to help our universe during these difficult times. This is a wonderful four month course that is geared for both beginners as well as those who’ve taken a break from their spiritual journey and need a refresher course! Be sure to look at the course information below and I hope you'll take part in this exciting course! This course includes a one hour phone class each month of the course that offers dedicated and individual one-on-one time with just you and Christopher to focus extensively on your specific spiritual and psychic goals. There will also be some powerful developmental exercises geared to your own individual spiritual needs for divine enrichment and psychic development as well as some spiritual homework assignments and hands on exercises which are specific to each course participant. Everyone is different, what may work perfectly for someone else, may not work well with you -- that's why this course and will be specific to your own spiritual journey! Are you ready to take the next step on your psychic & spiritual journey? Still need some help understanding your gifts, strengthening them and using them? Want to learn how to create and start a successful psychic & spiritual business? doing the work that you love and have always wanted to do! This course includes a one hour phone class each month of the course that offers dedicated and individual one-on-one time with just you and Christopher to focus intensively on your specific advanced spiritual and psychic gifts and abilities. There will be some powerful developmental exercises geared to your own individual spiritual needs for advanced enrichment and psychic development as well as some spiritual homework assignments and hands on exercises which are specific to each course participant. Everyone is different, what may work perfectly for someone else, may not work well with you -- that's why this course and will be specific to your own spiritual journey! The time to embrace, define & develop your gift is now! There are so many gifted mediums in the world, with new ones awakening and being born into life each and every day. I'm so excited to offer a course specifically about Mediumship. Mediumship is such a treasured gift, and now through this intensive three month course, I'll work directly with you to help define, develop and strengthen your Mediumship gift which will help you to gain further confidence and validation about your gift, allowing you to offer readings to clients & more! This promises to be a learning adventure you'll never forget! This course includes a one hour phone class each month of the course that offers dedicated and individual one-on-one time with just you and Christopher to focus specifically on your Mediumship gifts and abilities. There will be some powerful developmental exercises geared specifically to your own individual Mediumship needs for enrichment and development as well as some Mediumship homework assignments and hands on exercises which are specific to each course participant. Everyone is different, what may work perfectly for someone else, may not work well with you -- that's why this course and will be specific to your own spiritual journey! Are you ready to take the next step in your Mediumship development & spiritual journey? Would you like the messages from Spirit you receive to be more specific & accurate? Want to learn how to create and start a successful Mediumship & spiritual business? Join me for this intensive three month advanced course geared towards your continued Mediumship development and spiritual journey in sharing your ability to connect to The Other Side with the world and doing the work that you love and want to do! 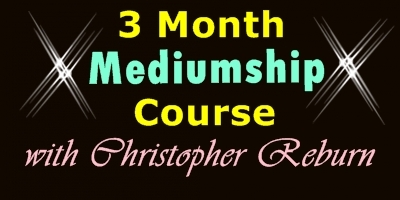 This course includes a one hour phone class each month of the course that offers dedicated and individual one-on-one time with just you and Christopher to focus specifically on your advanced Mediumship gifts and abilities. There will be some powerful developmental exercises geared specifically to your own advanced and individual Mediumship needs for continued development as well as some advanced Mediumship homework assignments and hands on exercises which are specific to each course participant. Everyone is different, what may work perfectly for someone else, may not work well with you -- that's why this course and will be specific to your own spiritual journey! Would you like to learn more about your healing ability? Would you like to develop and strengthen your healing ability to help others? Due to popular demand and continuous requests for me to offer a healing course, it’s finally here! This course is great for those who would like to expand and strengthen their healing ability to help and heal others! I also created this course because I get to see firsthand each day how many gifted healers & lightworkers we have among us that are not always sure where to start or where to begin -- This course is for you! This course includes a one hour phone class each month of the course that offers dedicated and individual one-on-one time with just you and Christopher to focus specifically on your healing ability. There will be some powerful developmental exercises geared specifically to your healing gift for continued development as well as some healing and spirituality homework assignments and hands on exercises which are specific to each course participant. Everyone is different, what may work perfectly for someone else, may not work well with you -- that's why this course and will be specific to your own spiritual journey! Would you like to improve your connection & communication with your Guides & Angels? Would you like to strengthen your connection to The Other Side? Our Spirit Guides and Angels are so important to our daily life and spiritual journey! Learn to connect and communicate more effectively with your Spirit Guides & Angels, offer insights to others from the Angels and much more! Learn how to do Angel Readings for clients, friends & family! This course includes a one hour phone class each month of the course that offers dedicated and individual one-on-one time with just you and Christopher to focus on your Angels & Spirit Guides. There will be some powerful developmental exercises geared specifically to connecting and communicating with your Angels & Spirit Guides, as well as some spirituality homework assignments and hands on exercises which are specific to each course participant. Everyone is different, what may work perfectly for someone else, may not work well with you -- that's why this course and will be specific to your own spiritual journey! plus add any one 3 Month Course and SAVE $29 off course fees! plus add any two 3 Month Courses and SAVE $69 off course fees! plus add all 5 of Christopher’s 3 Month Courses and SAVE $300 off course fees! This option includes all of Christopher’s courses! plus add any one other 3 Month Course and SAVE $29 off course fees! plus add any two 3 Month Courses and SAVE $68 off course fees! SAVE $206 off course fees! Must purchase courses at the same time in one purchase to receive discount. No other discounts of any kind will be accepted towards these course discounts. Not valid on previously purchased courses. All sales are final. There are no refunds or exchanges.